To achieve visibility from arbitrary positions in space (e.g. 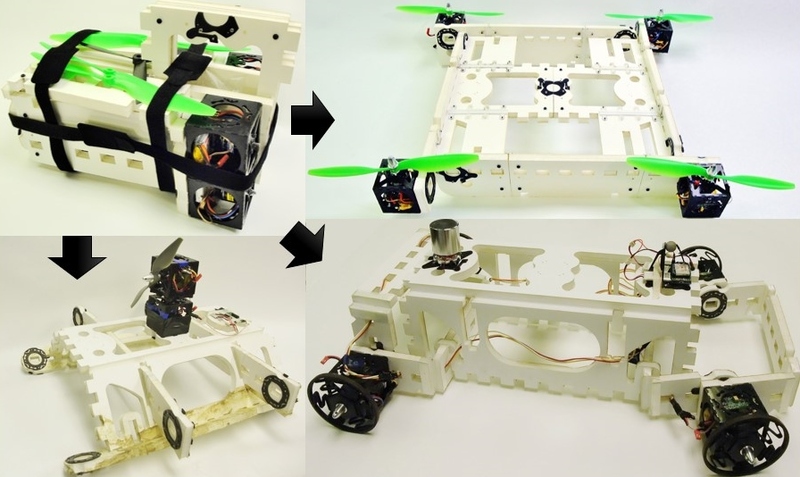 from flying) or high payload transportation over land and water, while being man-portable, compact, lightweight and low cost, we build one system that alternates between a boat, quadrotor, or car. The principle design goal reduces to finding part commonality for all three vehicle modes. While it is possible to find one vehicle configuration that simultaneously achieves everything, we have found a system that maximizes our performance metrics by alternating between configurations. The active components are brushless motor modules. These modules are similar to constant rotation (CR) CKBot modules. More details are coming soon. All passive components require buoyancy for the boat, high strength for the heavy payloads of the land vehicle, and high strength-to-weight ratios for the air vehicle. Once the environment for a given task becomes apparent and the user knows which vehicle is required, the user configures the passive components into the appropriate vehicle chassis and adds any vehicle specific components. We use male or female Modlock features made of 1/16 inch ABS as attachments point for modules and other passive components. In addition, some components are designed for peg-in-slot press-fits and allow us to mate components perpendicularly to each-other. The SEAL Pack has five frame components: one body and four arms. The body folds in three places; two folds are longitudinal and used to make the sides of the car and boat while the remaining fold is lateral and decreases packing size, giving the prominent handle in the packed configuration. The arms fold in two lateral locations allowing the car to have parallelogram steering when two arms are connected end to end and parallel to each other. By proper selection of vehicle types, task specific components that react with the external world can be small and simple. For example, a traditional helicopter has one large driving motor with an articulated propeller, a number of small actuators to articulate this propeller, and a smaller tail rotor. The majority of these components are different and specific to this vehicle. On the other hand, a quadrotor has four, identical driving motors yet fills the same vehicle niche. The only task specific attachment for the quadrotor missing from the kit is four, nearly identical, fixed-pitch propellers. The situation is similar for the car and boat. The car has four identical tweels (tire+wheels) for added spring suspension. The airboat has a propeller and a ModLock connector mounting modules together. 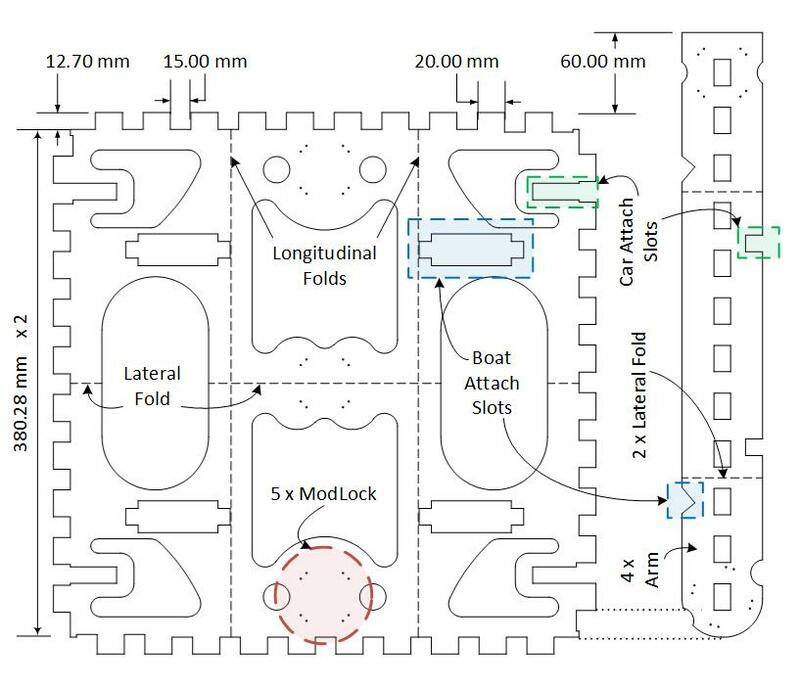 M. Piccoli, S. Revzen, and M. Yim, “Seal pack versatile, portable, and rapidly deployable sea, air, and land vehicle,” in Safety, security, and rescue robotics (ssrr), 2013 ieee international symposium on, 2013, pp. 1-6. Nov 07, 2013 | Filed under CKbot, Flying Devices, Search and Rescue, Uncategorized and tagged with Piccoli.